2017 has been a pinnacle year for politics in Virginia. Not only has the Commonwealth entered into the national conversation because of this year’s gubernatorial election, but also because of the tragic events in Charlottesville. How this comes to define the future remains to be seen. Yet one thing is for certain, Virginia is changing and entering into a new phase of national prominence that is set against a political landscape where uncertainty is the only real certainty. Because of this, all eyes are now on Dr. Ralph Northam. Northam, the current Lieutenant Governor and Democratic candidate for Governor, has been a bedrock of Virginia politics since running for Senate in 2007. He has been a solider, doctor, seasoned legislator, and the progressive voice in an election where national politics are connecting locally and challenging the Commonwealth’s otherwise-genteel status quo. RVA Mag’s political director, Landon Shroder, chatted with Northam to get a feel for how the campaign season was shaping up post-Charlottesville and how his platform of job creation, support for the LGBTQ community, and fighting climate change is resonating with young people in Virginia. Shroder: Dr. Northam, it is a pleasure to speak with you again. I know you are busy so we’ll just hop right into it. Because of the Unite the Right rally, Virginia is now in the national conversation. How do we move forward after a domestic terrorist attack, like the one which happened in Charlottesville? Northam: I think your point is well taken. These individuals, these white supremacists, KKK, neo-Nazis that marched into a beautiful city, Charlottesville, [and] our wonderful University of Virginia. [They] brought in torches and shields and flags and semi-automatic weapons, spewing hatred, bigotry, and violence. You know, I commend Governor McAuliffe’s leadership and also Attorney General Mark Herring’s. And I spent a lot of time in Charlottesville, giving the message to these folks that they are not wanted and we don’t condone that kind of behavior–hatred, and bigotry in Virginia. That’s not what we’re about, and to please go to wherever you came from or go home and don’t come back. I think that’s good leadership to give that message. We’ve also started the healing process. We’ve been to three funerals: Heather Heyer, and two of our state troopers which lost their lives. Again, I think it is important for our leaders to step up and call it what it is: just as you said, domestic terrorism. This one individual weaponized his vehicle and ran over 19 people, killed one person, and that’s just not what this Commonwealth is about. We need to make sure to send that message out there loudly and clearly. Shroder: You’ve now signaled support for removing Confederate monuments in Virginia, yet polling for them to remain is split almost evenly. That doesn’t really provide a solid basis for reconciliation on both sides. Where is the balance in this argument? Northam: I think we have to look at the principle of it. Certainly if a statue in Charlottesville, Virginia gave these white supremacists an excuse to come in and spew their hatred and bigotry and left three people dead, then that has to lead to a discussion. Personally, I think that these monuments should be placed in a museum. If people want to go look at them and put that history in context, then that is their prerogative. If people chose not to, then that is also their prerogative. I think that needs to be at a local level, and I think there needs to be legislation to give localities the ability to make those kinds of decisions. And I think also, Landon, we need to tell the rest of the story. A lot of civil rights leaders that come to mind are Barbara Johns and Oliver Hill. We need to do a better job of telling their story. We as society need to look at these statues. And when they are symbols of hatred and bigotry and an excuse for these folks to cause this kind of violence and loss of life, then this is certainly a discussion that needs to take place. I have recommended that this be dealt with the localities. Shroder: The general feeling on the campaign trail, does the incident in Charlottesville now become the central issue in which voters make their decision in the remaining two months of the election? Northam: I think there has really been an awakening. Not only in Virginia, but in this country regarding race relationships, and again, it is a discussion we need to have moving forward. 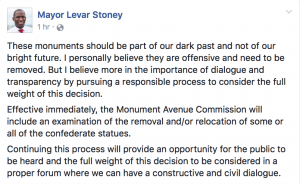 I would also say there are other monuments, Landon, that are not built out of bronze that need to be dealt with and those are inequities in income, inequities in access to education, access to healthcare, and voting rights. These are all issues that we need to discuss in the Commonwealth of Virginia. Also, we need to talk about other things that we are focused on such as work force development, such as jobs and the economy, access to healthcare, clean environments. All of these things are important. A lot of things will be talked about regarding this campaign for governor between now and November. Shroder: That leads me into my next question. You have spoken extensively on rural economics and have proposed a plan for accelerating jobs and economy in these spaces. You’ve talked about “new collar” jobs. Can you explain what those jobs are? Northam: Absolutely. First of all, our unemployment rate in Virginia, we’re very proud, has gone from 5.4 to 3.7 percent, the lowest that its been in nine years. We’ve brought in over 200, 000 new jobs. If one goes though to the Eastern Shore, where I’m from, or the Southwest, the unemployment rate is nowhere near 3.7. So we still have a lot of work to do. I have a plan on the table to restore and really bring back rural Virginia and we need to talk about the jobs of the 21st Century, which are STEAM [science, technology, engineering, arts, and mathematics] related jobs. There are some very good high paying jobs in areas like cyber-security, unmanned aerial systems, bio-technology, artificial intelligence, data collection and data analysis. These are the jobs of the 21st Century so we have to really think outside of the box on how we’re educating our youth and preparing them for these 21st Century jobs. So when I refer to jobs not as white or blue collar, but ‘new’ collar jobs, these are jobs that you don’t necessarily need a four year college or university education. And that’s why we’re promoting the G3 program: get skilled, get a job, and give back, which allows Virginians to go to community college for two years without incurring any debt, with the understanding that once they become certified they will give back a year of public service, with pay, or will work in a high demand area or high demand job in the Commonwealth. This allows people to continue their education, to prepare for new collar jobs, while not incurring any debt. Shroder: Just a follow-on question from that, a lot of our readers understand that there is innovation happening in urban spaces. How do we connect that innovation with the growth potential of rural spaces? Northam: There are a couple other things, Landon. Obviously there are still pockets throughout Virginia that don’t have access to broadband, this is something that I find unacceptable. Some still don’t have access to cell coverage, this is very important to rural Virginia. And one of the things that is part of my plan is to expand University of Virginia. Why? To bring talent into that area. When out of state students come to Virginia this is a great opportunity for them. When you bring talent to an area like that, talent attracts talent, and businesses will start up. And that will hopefully rejuvenate or jump start the economy in rural Virginia. Shroder: Speaking about young people, I think it is fair to say that a lot of young people now feel estranged from traditional party politics. How do you, as the most senior progressive voice in this election, reach them? What are you offering to get them re-engaged? Northam: That is a great question. Pam and I have two children, they are both millennials. One went to University of Virginia one went to William and Mary. And so I am very much in tune with our millennials. You know, there are several things we need to talk about: one is college affordability. We need to make sure that everyone can achieve the American dream. We also need to talk about the importance of a job, and prepare our youth for 21st Century jobs. So when our youth graduate from high school or college, they have a skill and that they are able to enter the work force. Again, things like healthcare should be important to all of us, but especially millennials. They need to know that they have access to affordable quality healthcare. Millennials are also very in-tune with our environmental issues and we’ve made a lot of progress in Virginia promoting renewable energy. And we’re planning by 2030 that 30 percent of our energy that is generated in Virginia is from renewable energy. Millennials also care very strongly about living in safe communities, where there are not guns on every street corner. These are a lot of the things I talk about with millennials, our children. I am certainly going to make a tremendous effort to get around to our colleges and universities and listen and hear with what’s going on with millennials and make sure we can attract them. We want them to they stay in Virginia, work and raise a family – that is very important to us. Shroder: As you know Dr. Northam, we also run GayRVA, and as I am sure you are very aware as of yesterday the president has issued guidelines on transgender soldiers. You were also a soldier, and one of those requirements will be removing them from the military altogether. I know this is a national issue, but how do we protect our transgender service members in Virginia? Northam: It starts with leadership. As you said, I served in the US Army for eight years, I fought beside folks from the LGBTQ community. I am very proud to have served with them, they have served their country just like everybody else and I think it is very short-sighted for our president to pick and choose who should be in the military. I will do everything I can, and I have in the past, to support our LGBTQ community. We understand that we live in a diverse society. That means we need to be inclusive, and as long as we continue to elect Democrats in Virginia, our lights will be on and our doors will be open, and we will welcome people to the Commonwealth. Shroder: You are taking a bit of heat for not coming out against the proposed Atlantic Coast and Mountain Valley pipelines. There does seem to be a myriad of issues surrounding these pipelines: property rights, how they impact on low income communities, in addition to the Commonwealth subsidizing methods of energy that are becoming obsolete. Doesn’t Virginia have a responsibility to lead nationally by opposing this planning? Northam: I appreciate the question, and I hope that people will look at my environmental record. I think I was the first elected official statewide to be outspoken against off-shore drilling. I have been opposed to fracking, opposed to uranium mining, I have done so much to restore the health of the Chesapeake Bay and taking phosphorous out of fertilizer. I hope people look at my environmental record and compare that to my opponents. I want to do everything I can to make sure I am a good steward of our environment. I have written a letter to the DEQ [Department of Environmental Quality] regarding the permitting process. We need to work with our DEQ and corps of engineers and I want to make sure it is done with transparency with public input, with science, and with environmental responsibility. Also taking into account people’s property rights. That’s what I want to do as the next governor. I will do everything I can to make sure that as the process moves forward it will be done with transparency and responsibility. I have said that all along and I will stand by my word. Shroder: Just one more on climate: the rate of sea level rise in Virginia is at three to one vs the national average. Not only is that an environmental crisis, but an economic crisis. Naval Station Norfolk has already signaled they might have to re-deploy the fleet. We’re all aware of what’s happening to Tangier Island–what practical things can we do? Northam: I took the lead on this Landon, several years ago when I was in the Senate. I put in legislation to study sea-level rise, especially in Hampton Roads. And because of that we’ve been able to apply for federal grants, which we have received, and we have a resiliency plan in place. I have been very involved with sea-level rise and will continue to be. As you said, it is not only a national security issue, but an economic issue for Virginia, and we need to make sure that we are doing everything we can to deal with this. So we need to have a resiliency plan and look at ways to decrease the amount of carbon we are putting into the atmosphere. As I said earlier, I have a plan to move 30 percent of our energy to renewable energy by 2030. And I think if we make that a priority, that is something we can make happen in Virginia. Shroder: That’s all from my side. Thank you for taking the time to chat with us and always a pleasure to speak with you. Northam: I appreciate everything your doing and keep up the good work! The first debate between Virginia’s gubernatorial candidates took place at the Virginia Bar Association’s summer meeting on Sat., July 22. RVA Mag was on the scene to bring a blow by blow account of the sparring match between Democrat Ralph Northam and Republican Ed Gillespie. The first attack on Lt. Gov. Ralph Northam did not come from Republicans, but the progressive base of his own party. Northam had barely started his opening statement when a protester interrupted him with cries of “No pipeline!” The project he was referencing, the Atlantic Coast Pipeline (ACP), has become an internal flashpoint between establishment party members and the progressive wing of the Democratic Party. Northam, Gillespie, and Dominion Power all support the ACP. The audience laughed as the activist shouted, “This stage is owned by Dominion Power!” before being escorted away, but the incident highlighted the extent to which both candidates have distanced themselves from the more vocal elements of their own parties. 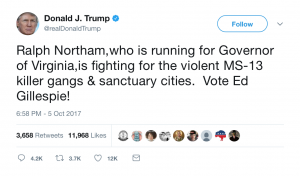 Unfazed, Northam immediately linked his opponent Ed Gillespie to President Donald Trump. Ralph Northam. Photo by Norfolk Democrats. “I believe the president is a dangerous man,” said Northam, adding that Trump “lies like a rug.” This was a familiar refrain, as his campaign has dedicated much of its energy to linking Gillespie with the deeply unpopular president. On that issue – as well as on issues like the Second Amendment – Gillespie stuck to his proverbial guns, saying that he would work with the Trump administration, but that the gubernatorial race should be about Virginia, not Washington. Gillespie cautiously sidestepped his personal opinion of the president. Instead, he pivoted instantly to defense spending when asked if he would continue to support Trump in the event he fired Robert Mueller – special counsel for the investigation into the president’s ties with Russia. Early and often, Gillespie argued that Virginia had fallen behind economically during Northam’s tenure as lieutenant governor. Gillespie also mentioned several times that he is the son of an immigrant, claiming he “can relate” to those who are here “through no fault of their own.” Yet in the same breath, he echoed the president’s harsh stance on immigration. When pressed by the moderator, Judy Woodruff of PBS NewsHour, he eventually revealed he would not challenge the Trump administration’s deportation policies. Northam seized on this opportunity to draw a contrast between himself and Gillespie. “Virginia has to be inclusive, our lights have to be on. 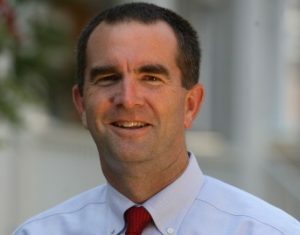 Our doors have to be open,” Northam said. Not long after his message of inclusivity, he seemed to double back by adding, “ICE should be allowed to do their job.” It was a sentiment he shared with Gillespie, but clearly not with the more progressive wing of his own party. As the two went back and forth over relatively minor points on immigration, Woodruff bluntly asked both to explain where they differed on the issue. 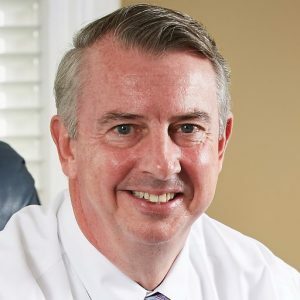 Gillespie stated that he was opposed to allowing undocumented immigrants to attend state universities, likening Northam’s education plans to those of Bernie Sanders who called for undocumented immigrants to qualify for in-state tuition – a common Republican tactic. When it was time to debate healthcare, Northam leaned on his experiences as a doctor and the unpopularity of Trump’s recently failed healthcare initiatives, as he has for most of the campaign. Northam repeatedly emphasized how many Virginians are in imminent danger of losing medial coverage. Gillespie, of course, decried Obamacare as being costly and inefficient. Noticeably omitted was any answer to one of the major questions hanging over the debate: should Republicans repeal Obamacare without having a replacement ready? Northam, usually a firm centrist, every now and then did go full progressive. This was especially true when it came to criminal justice reform and one of the more sweeping elements of this platform – decriminalizing marijuana. 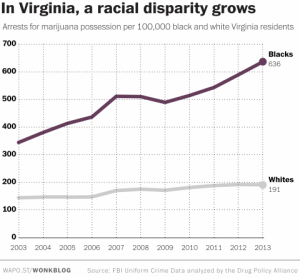 It is no secret that Northam wants to end the prohibition of marijuana, however, it still felt like a watershed moment to hear a major-party candidate (with a calm Eastern Shore voice) say, “We need to sit down at the table and talk about decriminalizing marijuana.” More than once during the primary he spoke about the disproportionate rate of incarceration for African American communities over marijuana usage. 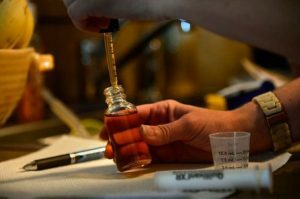 Gillespie made no comment about marijuana decriminalization, but there’s little doubt where he stands. Republican Attorney General Jeff Sessions has already started taking steps to re-enforce mandatory minimum sentencing over non-violent drug offenses. 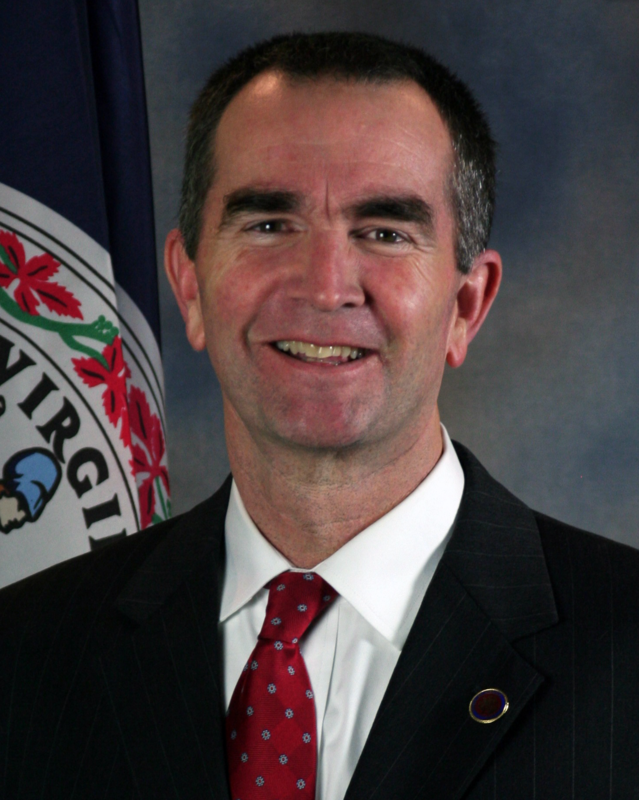 Northam also noted that he differed from Gillespie and, for that matter, Governor Terry McAuliffe in his opposition to the death penalty – referencing the high-profile execution of William Morva on July 6. One of the most jarring moments came as the conversation turned to the Second Amendment. Northam described the flow of guns into Virginia as another “pipeline” that needs to be shut down. As the audience reacted to his sobering reminder about the Virginia Tech massacre and the importance of keeping guns off campus, Gillespie responded by proudly referencing his A rating from the National Rifle Association. Much of the first gubernatorial debate boiled down to a checklist of establishment viewpoints on various issues important to both parties in the Commonwealth. In fact, the furthest either candidate strayed from the base of their own party was Northam’s support of the natural gas pipelines, something many Virginia Democrats, liberals, activists, and progressives actively oppose. “We’ll write in ‘No Pipeline,’” said his wife, Jill Averitt, when asked if either candidate had won their support. After the debate, Northam reiterated that he did oppose fracking, but would allow fracked oil to enter the state via the ACP if it could be done responsibly. A short time later, he left to join his opponent and their respective entourages at a reception sponsored by Dominion Power. A neutral observer would have a hard time deciding who won, a predictable outcome for a debate between two establishment candidates. While Northam hit his predetermined talking points and fired off a few memorable quotes, he came off stiff next to Gillespie, whose conversational tone provided cover for his refusal to give straight answers on some fairly important questions. Nor does it bode well for Northam that the pipeline protest – which he inexplicably referred to several times throughout the later stages of the debate – was the most memorable event of the afternoon, highlighting the internal schism between the different wings of the Democratic Party of Virginia.